Completely remodeled, this two-bedroom, two-bath home boasts spectacular mountain views, an airy floor plan with high ceilings, beautiful hardwood floors, and new furnishings. Nestled into a quiet cul-de-sac just a short walk from world-renowned Hanalei Bay, it provides the perfect, peaceful hideaway for your escape to paradise. The large, open common area at Hale Kanani includes a bright and cheerful living space with plenty of comfortable seating, a well-appointed kitchen with an eat-in breakfast bar, and a lovely dining area. The master bedroom features a king-size bed, an en suite full bath, and direct access to a covered lanai with breathtaking views of the mountains and the lush, tropical landscape. Bedroom two has a queen-size bed and its own full bath. Hale Kanani also offers amenities such as air conditioning (window units) in the bedrooms, complimentary wireless internet, a flat-screen cable television, a DVD player, and a washer and dryer. Outside on the spacious lanai, a gas grill and seating area create an opportunity to revel in the indoor-outdoor island lifestyle. 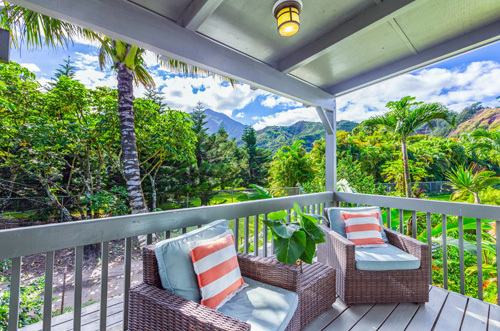 This charming Hanalei cottage allows easy access to activities such as surfing in Hanalei Bay and kayaking or stand-up paddling on the Hanalei River. Just a two-block stroll from Hanalei town, the home is also conveniently close to restaurants, and shops.